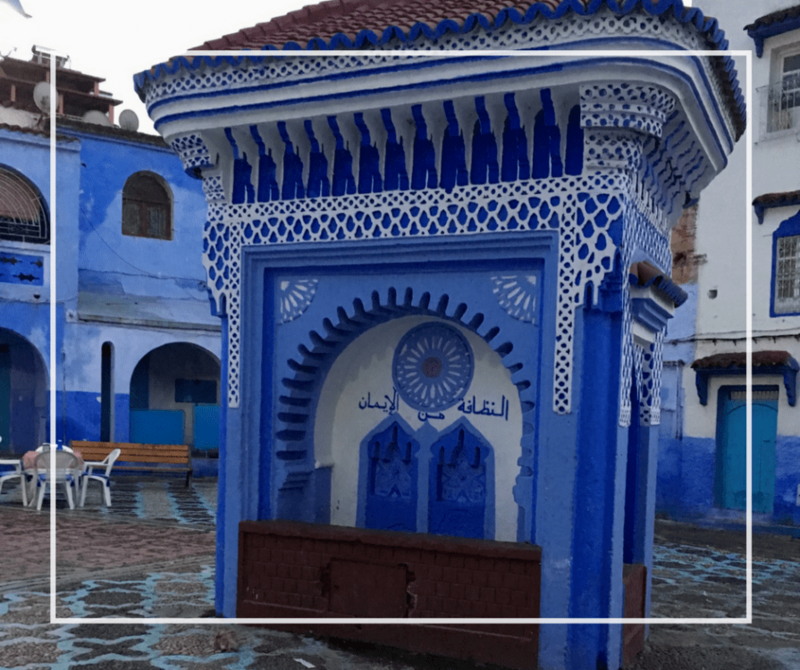 You fell in love with the pictures splashed across the internet of a blue city in Morocco, hidden in the hills. 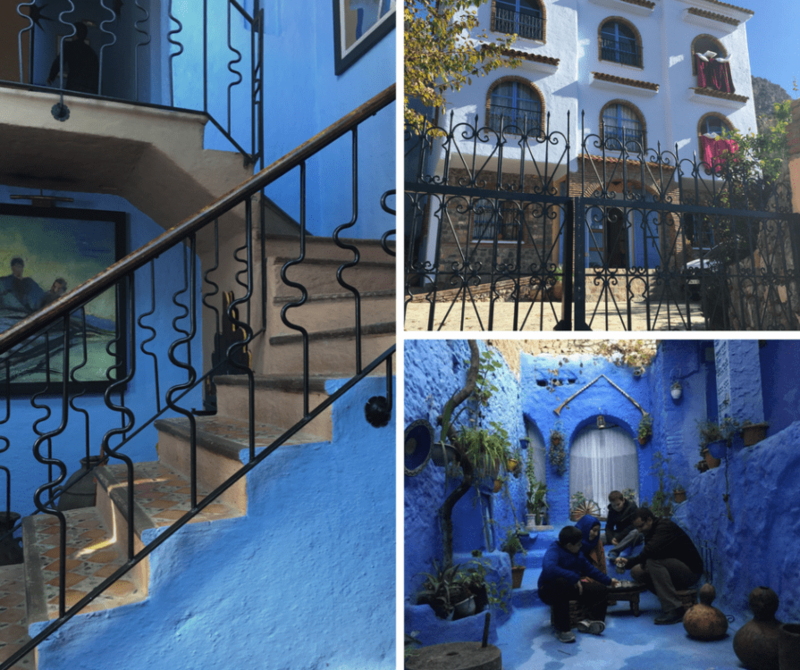 I fell in love when visiting too but Chefchaouan Morocco, the “blue pearl” is a long way from just about everything. It took me years to make it here simply because it’s really out of the way! When our kids had a week off school this December we decided to stay in Morocco instead of going abroad. 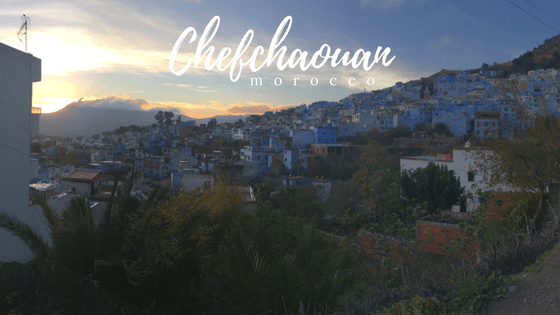 Usually we go south or to the coast, but this time we opted to go north including Chefchaouan. To say I was excited is an understatement. 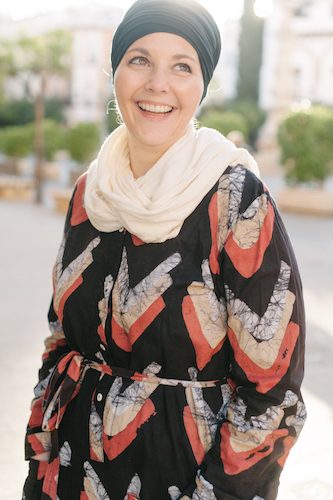 We drove from Marrakech to Asilah (more on that in another post) for the first few nights, stopping in Tangier before making our way across to Chefchaouan. The city is two-and-a-half hours south of Tangier and three-and-a-half hours north of Fez through winding mountains and small villages. When you reach the city there are glimpses of blue but I was scratching my head, it wasn’t blue! But, as we crawled through the streets to reach the city center the blue took over. There are three ways you can reach the city; via private car, a hired car and driver or bus. Which ever option you choose, know that you will be driving on mountain roads for 2-3 hours minimum. If you get car sickness this might be something worth considering. I mentioned above a little bit on distance. Many people ask if they can take a day trip from Marrakech to Chefchaouan. This is not possible. It is a full day driving between these two points and not possible without an overnight stay. 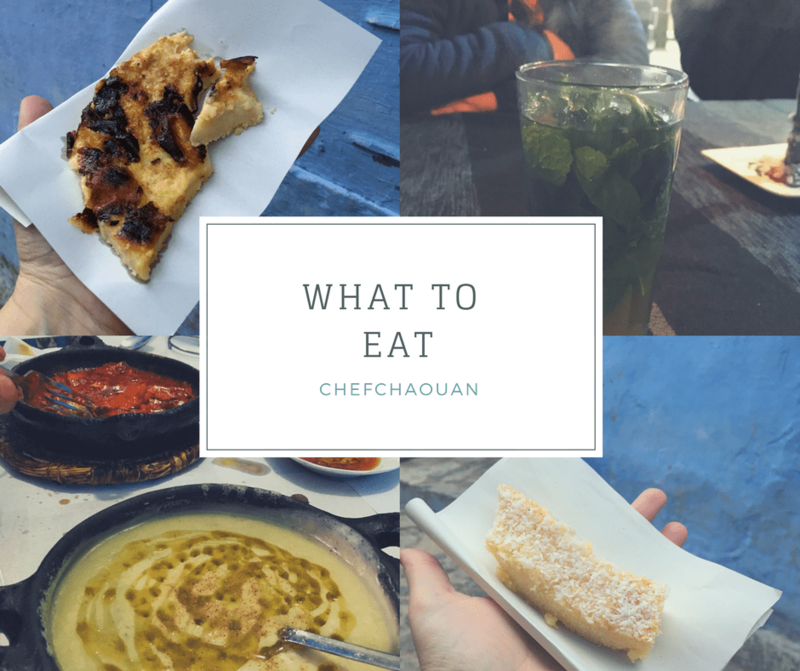 If you are coming to Chefchaouan to do “things” then you’re going to be sorely disappointed. There’s not a lot to do here. It’s a small village that’s full of blue streets that criss-cross the medina. It seems like there’s a great photo opportunity at every corner. 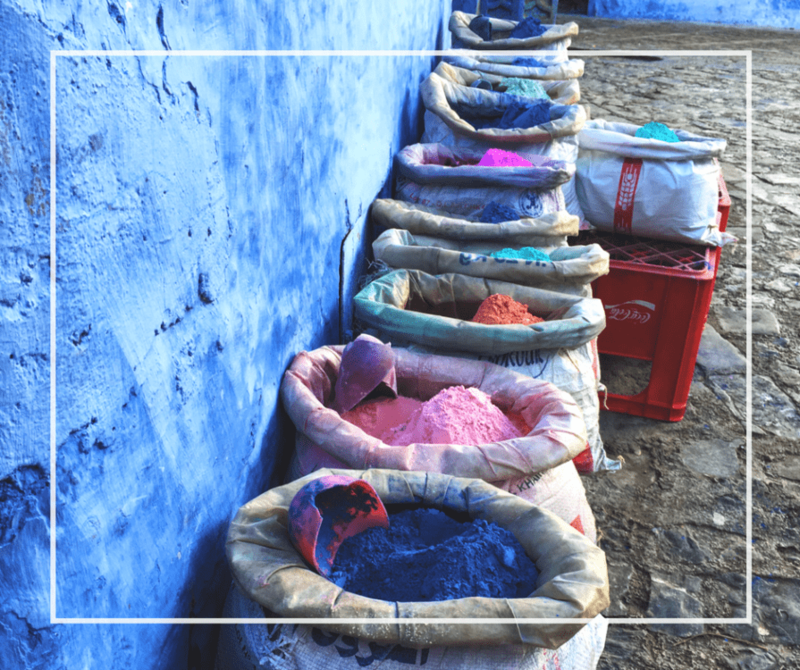 Chefchaouan is like a lot of Moroccan cities but it’s different in a lot of ways too. The people are very friendly, there’s always something for sale and there’s a sense of rustic beauty everywhere. But, we found in a lot of ways the food was different. I even discovered a few things that I’d never seen before. It might also come as a surprise to visitors that hashish is openly smoked and sold, it’s always on offer even if you’re walking around with your kids but it’s no big deal if you turn it down. I’m really glad that we visited because it’s truly a really unique place. But, keep in mind there’s a lot of tourists these days. We weren’t too bothered by this (we live in Marrakech after all!) but it could take away from your experience. I also would advise against visiting on Friday’s when many things are closed for the Islamic holy day (at least for part of the day). How long should you stay? We thought one night and two days was enough. It let us explore, eat in a few places and wander around at our own leisure. It’s also worth keeping in mind your travel time getting to and from the city. It’s also worth noting if you have a small child in a stroller or someone with you that has walking difficulties this is going to be a hard town to enjoy. It’s a city built on the side of a mountain so you can expect lots of steps, uphill and downhill walkways and winding roads. The medina is car free. This is the head of the waterfall that feeds the city. We were staying very near this so it made sense to go check it out. If we weren’t staying nearby I probably wouldn’t have bothered but, I’m so glad we did! This is also the perfect spot to start your walk down through the medina. We did one day and it took us about 45 minutes with stops along the way to make our way down. Much easier walking down than up! This is pretty obvious. You’re going to want loads of pictures of this city, there’s great pictures everywhere! Just be respectful and remember people do live here, it’s not just a pretend village! 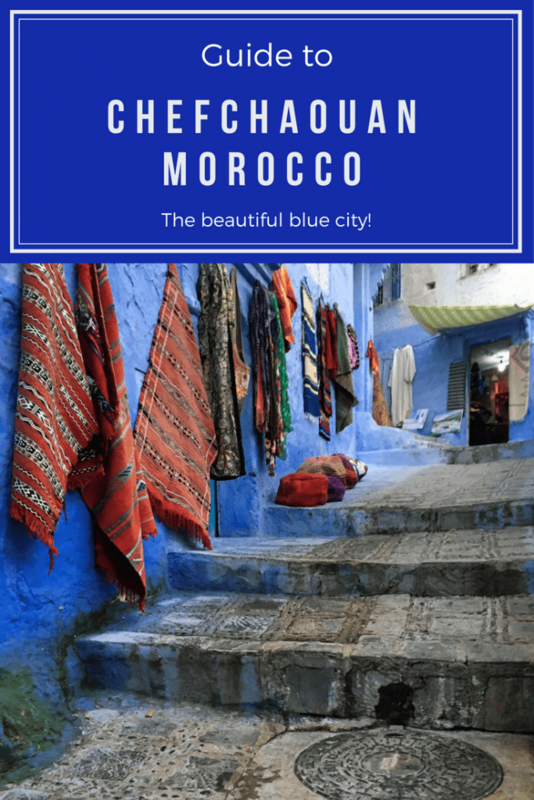 Chefchaouan isn’t a big shopping mecca like Marrakech but they do have some great things. MarocBaba bought a wool men’s djallaba and I picked up two wool woven lap blankets for a steal. They’re well made and different from anything found in other Moroccan cities. There are also some great woven textiles that are locally made and unique to the region. People watching is a pastime I’m just learning to appreciate. We pulled up a chair several times to just relax and watch the city pass by. I loved that in Chefchaouan the tea comes in GIANT glasses (well at least compared to tea in other cities). Drink a few glasses! One thing interesting about this small town is that there is a mix of hotels and riads available to rent. For a small city there were a lot of options. If you have any walking difficulties it’s advisable to book a hotel outside the medina. If you don’t book one inside to be surrounded by the blues! It’s also worth keeping in mind that because the city has become so popular the prices of rooms is higher than we expected. You can find budget options but they’ll be harder to find and book up fast. Dar Echchaouen – This is one of the more expensive options in the city but the rooms were nice and there was hot water most of the time (there was a small issue on the morning we left). Hotel Alkhalifa – We stayed here one night when we realized the medina riads weren’t going to work for my mother in law. We would have stayed both nights if we could have but they only had a room available for the first night. The owners are so kind and accommodating. The rooms were basic but clean; the bathrooms a little small but they work! Medina Riads – If you want to stay right in the middle of the city there are plenty of options here. Kalinte – On one of our walks we passed a little hole in the wall that was serving things out the window. I had no idea what it was but I knew I wanted to try whatever they had. One of the things was kalinte, a dish I knew about but hadn’t eaten, which is kind of like a savory pancake made with chickpea flour (gluten free yay!) and eggs then dusted with salt and cumin. I really liked it! Shemiya – This was something else that the little bakery had. I’d never even heard of this. It’s sweet and made with semolina, coconut and a type of syrup, served cold. It was something really different and I’m glad I tried it but kalinte is more my style. Restaurant Beldi Bab Ssour – I almost don’t want to tell you about this place because it’s such a good find. It’s arguably the best restaurant in Chefchaouan but nothing special to look at. You’ll have to hunt a little bit to find it but I assure you it’s worth it. The menu is limited and when food runs out, it’s out so don’t plan to eat lunch after 2pm (don’t worry there’s a new batch for dinner). The owner brought us a special mushroom dish made with local mushrooms that I still think about. The food is authentically Moroccan and incredibly affordable. I am so glad that we finally went to Chefchaouan and I think it’s a great place to visit. But, if you’re thinking of going out of your way to reach it, I personally am not sure it’s worth it. It’s a ten hour drive from Marrakech and not something I’d suggest if it’s the only thing you want to do in this part of the country. If you plan to be in Fez or Tangier then it makes great sense to go! Great post! We just got back from Morocco a few weeks ago and this was one of the last cities we visited. We really loved it and it was actually our favorite city that we visited other than my husbands home town. But you are really not kidding about it being out of the way!! If you’re coming from the north and you have standard iPhone gps, the route will take about 4 hours longer than what it says, and the map will not warn you about how dangerous it is (my gps does not even show mountains). Our drive to get there was hair raising to say the least. It was all worth it once we got there though! !